Though Wolverine was first seen in “The Incredible Hulk” #180, it is the following issue where the hero makes a full appearance. “Moving is the thing I do best,” says Wolverine scaling over the Hulk during their initial showdown in “The Incredible Hulk” #181. After almost 40 years of stories, readers are certain of what Wolverine does best, and it isn’t leaping over Green Goliaths. Gymnastics aside, the Wolverine conjured up by Len Wein and John Romita, Sr. carries many of the traits of the Canucklehead who exists today. Starting with jumping headfirst into action with zero concern that his opponent has the power to tear him in half. Wein created Wolverine to eventually be used in his and Dave Cockrum’s X-Men relaunch in 1975 (“Giant-Size X-Men” #1). It was Romita, Sr. who designed the character and ferocious claws that “Incredible Hulk” artist Herb Trimpe would more fully realize in the issue. 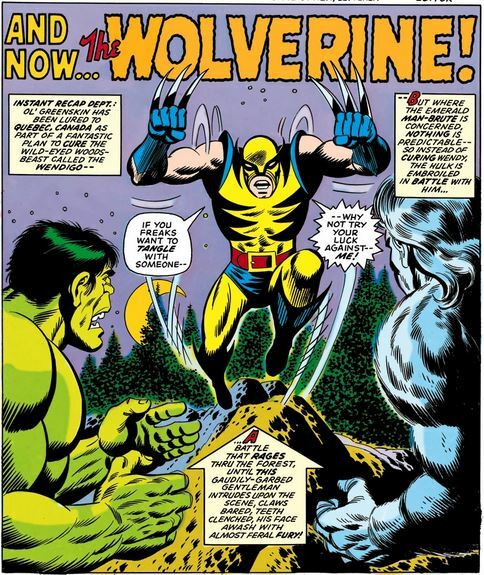 “And Now… The Wolverine” is the second part of a Hulk adventure in which the hero returns to Quebec, Canada (after his last match with the Wendigo in “The Incredible Hulk” #162) and does battle with the cannibalistic monster a second time. We learn that Hulk has been drawn back to Canada as a result of the bewitchery of Marie Cartier, whose brother Paul was transformed into the Wendigo. One of the most deliciously vile origins in comics belongs to the Wendigo who, in the case of Paul Cartier, was turned into the creature by the spirits of the woods after Paul chose to revert to cannibalism to survive. Marie has discovered a spell that will transfer the curse from Paul to another host. With the help of Paul’s best friend Georges Baptiste, Marie lures Hulk into a mysterious cave where she plans to conduct the switcheroo and get Paul back and on a regular diet again. Sedated by drugged food, Marie prepares to convert a slumbering Hulk but he awakens for more fisticuffs with Wendigo. This leads readers right into the character’s first full appearance in “The Incredible Hulk” #181. Much of what is learned in this first appearance are characteristics that have endured over the years. Wolverine is a bullet. The pint-sized soldier, described here as 5’5” tall, jump into the fight certain that he can subdue both Hulk and the Wendigo. Logan’s hubris is on display from the opening splash. There’s not a single line of dialogue, thought bubble, nor omniscient narration where it occurs to Wolverine that Hulk might be too tough an aggressor. Later in the story it’s revealed that Wolverine requested that the military give him six hours to bring in Hulk and Wendigo singlehandedly before the cavalry is sent into the fray. Using his wits to fool Hulk into concentrating his gamma-fueled punches towards Wendigo, Wolverine demonstrates that his tactical skills will make up for whatever these beasts have in the way of brute force. Sure, pulling one over on this lumbering version of Hulk might not make Wolverine a strategist on the level of Patton, but it demonstrates that he is more than just a man of action. Wolverine is up for a serious scrape in this issue, which remains characteristic of the pint-sized hero five decades later. It isn’t clear in this first appearance what Wolverine’s powers are, though one of his commanding officers says, “The government has spent a great deal of time, effort, and money developing that mutant’s natural-born speed, strength and savagery into the skills of a professional warrior—and despite a few kinks still remaining in his psychological makeup, I think we’ve done a pretty good job.” By this brief exchange we can gather that there is something superhuman about Wolverine but that didn’t stick. However, the “kinks” to his psychological makeup is something that future writers would chip away at and reveal for years to follow. While the hero does not go into one of his famed berserker rages, he is described as having “an almost feral fury” as he jumps claws first into the beastly fracas. 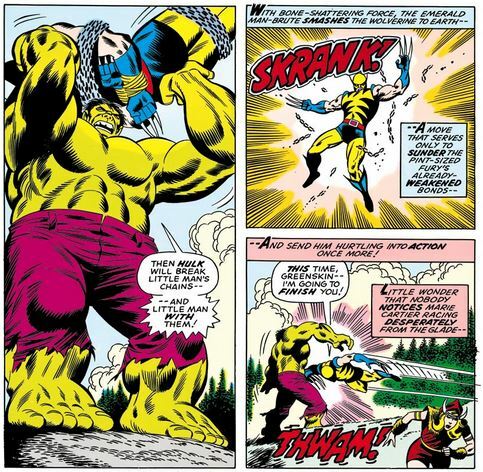 Even after being chained from head to toe and lying on the ground, Wolverine continues to taunt Hulk as though he has the upper hand (think of the Black Knight scene from “Monty Python and the Holy Grail”). Certainly Wolverine is doing this to anger Hulk into setting him free, but Hulk quickly ends the fight with a “Bwok!” to the face that lets readers know Wolverine’s part of the story has finished. He is saved from the massive impact of Hulk’s knuckle sandwich by his “astonishing stamina” as opposed to his healing factor (which isn’t revealed until “Uncanny X-Men” #116). Wolverine’s claws don’t retract for the duration of the story but they are identified as being made of “diamond-hard” adamantium. Again, this part of Wolverine’s backstory is explored and fleshed out over years of stories, from what Weapon X has done to Logan (“Marvel Comics Presents” #72 through #84) to the fact that his claws are not manufactured but are indeed his bones (“X-Men” #25). Verbosity and pussycat whiskers are features of the Wolverine introduced in “Incredible Hulk” #181 that would not remain familiar to readers. Over the course of the battle Wolverine talks and talks and talks. Yes, Wein is using a common convention of the time to further identify who Wolverine is, but it doesn’t gel with the singularly focused soldier he would become. Then there’s the mask. There is nothing fearsome about the verging-on-silly feline mask designed by Romita. Make no mistake, the rest of the character design works. From the winged boots, to the bold catlike stripes, to the ironic use of bright primary colors on so ferocious a character, the remaining elements of Romita’s costume are first-rate. Artists have continued to riff off of this design time and again as Wolverine has gone through numerous costume changes since his introduction. Towards the end of the battle between Hulk and Wolverine, Marie uses a potion which brings both combatants down. Even after Hulk reverts to his alter ego, Bruce Banner, Marie is still willing to go ahead with transferring the Wendigo curse onto an innocent man. Stunned at Marie’s callousness, Georges returns to the cave where Wendigo lies out cold from his fight with Wolverine. In the following scene Georges, frustrated with the part he’s played in Paul’s metamorphosis, commiserates about what he must do to clear his conscience and save his friend. Wendigo stumbles towards Marie waving his arms, as though he’s trying to communicate with her. Marie knows something is wrong. She sees her brother Paul on the cement slab where the Wendigo had laid unconscious. Georges has passed the curse of the Wendigo onto himself. Still retaining some human ability to communicate, Georges tearfully confesses that he did not become Wendigo to help Paul, but because he loved Marie. Wendigo breaks through the wall of the cave and races into the woods, leaving Marie emotionally crushed. The story finishes with a compassionate Hulk comforting Marie as she sobs for her lost love. As for Wolverine, the final shot of ‘ol Logan is of his feet as Hulk passes by his clocked-out body. Six months later, Wolverine would make his follow-up appearance when he heads off with Charles Xavier to join the professor’s new international team of X-Men in “Giant-Size X-Men” #1. Moving, we would learn as the years passed, was not the thing Wolverine did best. Unless he meant moving his adversaries from life to death.